Age related macular degeneration is a problem with the central portion of your retina, called the macula. The cells in this portion of the retina may degenerate, leading to yellowish spots called drusen in the early stages. This can cause gradual loss of the central vision, which we use for daily activities like reading, watching television, recognizing faces, and any activity that requires seeing fine detail. About 1-2% of the population has AMD. Eating a healthy diet and wearing UV protective sunglasses can be protective against AMD. Dry AMD is the most common form of the disease, affecting 80-90% of those patients with the AMD diagnosis. There is currently no effective treatment for dry AMD, though your doctor may recommend you take a special combination of vitamins to attempt to slow the progression of the disease. 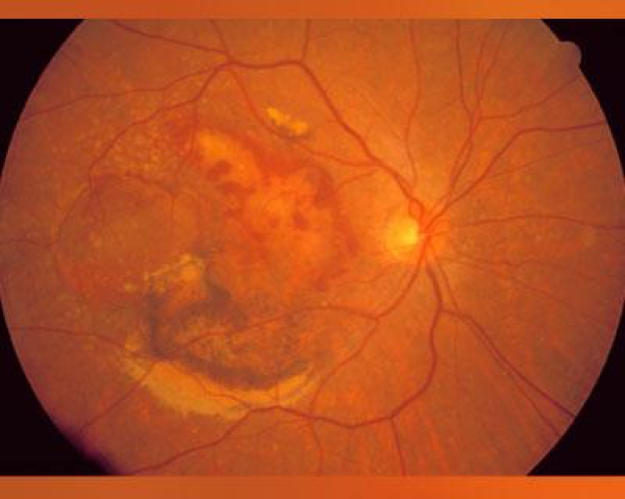 Fundus photograph of a retina with soft, confluent drusen from dry macular degeneration. Wet AMD is the much less common form of the disease but is usually more visually damaging. Wet AMD occurs when abnormal blood vessels grow under the retina, causing leakage of fluid and blood. There are more treatments for patients with wet AMD, including injections of anti-VegF medications into the eye or laser therapies. The goal of both of these treatments is to reduce the number of abnormal blood vessels and slow the leakage into the retina. 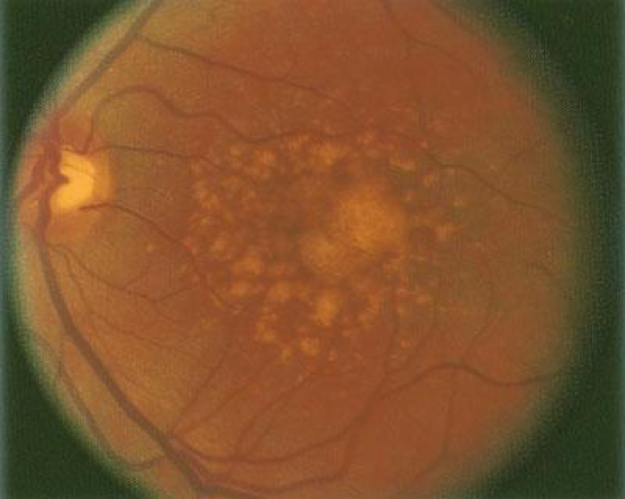 Fundus photograph of a retina with wet macular degeneration. A comprehensive dilated eye exam is required to diagnose macular degeneration. Your doctor will see drusen or other changes in the retina. Ancillary testing such as OCT (optical coherence tomography) and FA (fluorescein angiography) can help in qualifying the extent of the disease. If you have been diagnosed with AMD, you should routinely check each eye using an Amsler grid. This will help catch changes in vision and your disease process that may be treatable.